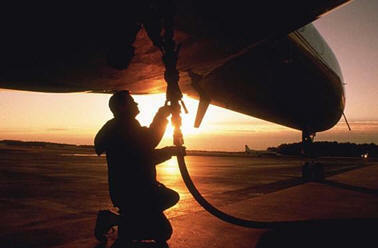 March 26, 2012 - The International Air Transport Association (IATA) announced a downgrade to its industry outlook for 2012 primarily due to rising oil prices. IATA expects airlines to turn a global profit of $3.0 billion in 2012 for a 0.5% margin. This $500 million downgrade from the December forecast is primarily driven by a rise in the expected average price of oil to $115 per barrel, up from the previously forecast $99. Several factors prevented a more significant downgrade: (1) the avoidance of a significant worsening of the Eurozone crisis, (2) improvement in the US economy, (3) cargo market stabilization and (4) slower than expected capacity expansion. ?2012 continues to be a challenging year for airlines. The risk of a worsening Eurozone crisis has been replaced by an equally toxic risk rising oil prices. Already the damage is being felt with a downgrade in industry profits to $3.0 billion,?? said Tony Tyler, IATA?s Director General and CEO. Airline performance is closely tied to global GDP growth. Historically, when GDP growth drops below 2.0%, the global airline industry returns a collective loss. ?With GDP growth projections now at 2.0% and an anemic margin of 0.5%, it will not take much of a shock to push the industry into the red for 2012,? said Tyler. IATA revised upwards its estimated profits for 2011 to $7.9 billion from the previously forecast $6.9 billion. This was primarily owing to the much better than expected performance of Chinese carriers. The major driver of reduced profitability is rising oil prices. In December 2011, the consensus forecast for 2012 stood at $99/barrel for Brent crude. The average price year-to-date is approaching $120 and the consensus forecast for the year has been revised to $115 (from the $99 previously forecast). This will push fuel to 34% of average operating costs and see the overall industry fuel bill rise to $213 billion. Political tensions in the Gulf region increase the risk of significantly higher oil prices, the implications of which could put the industry into losses (see separate scenario described later in this release). Overall capacity (passenger and cargo combined) is expected to grow by 3.2% in 2012 (based on announced schedules) which is behind the 3.6% expected expansion in demand. This is a reversal of the expectation in December of capacity expansion (3.1%) outstripping demand (2.9%). Both passenger load factors and aircraft utilization have returned to or above pre-recession levels. In January the passenger load factor stood at 76.6%, which is more than 2 percentage points higher than pre-recession levels. The average hours flown by passenger aircraft is also close to pre-recession peak utilization rates. Asset utilization in freight markets is more difficult to manage as around 40% of cargo capacity is in the belly of passenger aircraft, responding to different market pressures. Freight load factors in January were 6% lower than the 2010 peak and average hours flown by freighter aircraft were down 11%. In December yields were forecast to be flat in 2012 for both passenger and cargo. Higher fuel costs, tighter capacity management in passenger markets and the stabilization of freight markets is now expected to drive a 2.0% yield improvement in 2012 for both passenger and cargo. North American carriers are expected to deliver a profit of $900 million, down from the previously forecast $1.7 billion. The 2.0% EBIT margin shares top position with Asia-Pacific carriers. Higher fuel costs are responsible for the downgrade, but airlines in this region will see the smallest deterioration from last year?s performance among the major regions, as a result of the very small increases in capacity expected. Asia Pacific carriers continue to perform well. Better than expected performance in 2011, particularly by the Chinese carriers?saw an upward revision of 2011 profits to $4.8 billion (from the previous estimate of $3.3 billion). For 2012, the region?s airlines are expected to again deliver the largest absolute profit--$2.3 billion?which is $200 million more than estimated in December. Higher fuel costs will more than halve profits this year but the region?s relatively strong economies will continue to generate more rapid growth in travel and cargo than the other large regions. Latin American profits are expected to be $100 million, unchanged from the previous forecast. Performance is mixed across the region, but intense competition in some major markets and slowing economies will make it more challenging for the region?s airlines to recover the increase in fuel costs they face this year. African carriers are still expected to see losses of $100 million, unchanged from the previous forecast. Some of the region?s economies are growing strongly and generating expanding demand for air transport. However, passenger and freight load factors are very low on average for airlines in this region which will make it difficult to recover the rise in fuel costs. A number of commentators have pointed to a scenario where an escalation of the crisis in Iran could see the closure of the Strait of Hormuz cutting off vital supply links for oil. In this scenario, oil prices could spike at $150/barrel for Brent crude mid-year, for a full year average of $135. In such a scenario, global GDP growth would fall to 1.7%, plunging the entire industry towards losses of over $5 billion. ?While we have seen some improvements in economic prospects any further significant rise in the fuel price will almost certainly turn weak profits into losses,? said Tyler. ?Airlines are buffeted by many forces beyond their control. Today?s forecast demonstrates just how quickly the operating environment can change. Four months ago the biggest worry was a European financial disaster; today it is rapidly rising oil prices. Nimbleness and operating efficiency are critical to maintaining competitiveness and managing through such dramatic shifts,? said Tyler. ?A sustainable airline industry could deliver much more to the global economy. But the unintended consequences of many government policies have contributed to keeping the industry on a knife-edge between profit and loss. Short-sighted excessive tax collection in many markets undercuts aviation?s ability to provide access to the connectivity that drives global business,? said Tyler. ?Regulation implemented without a clear cost-benefit analysis often scores political points at the expense of industry efficiency let alone solving the problems it was intended to address. Failure to drive forward important infrastructure modernization projects such as NextGen and Single European Sky, limit the effectiveness of the billions of dollars that airlines are investing in more efficient and capable aircraft.? ?Today?s industry situation reinforces the need for governments to take a more strategic approach to aviation with competitiveness-enabling policies that will deliver broad economic benefits. This has been tried, tested and proven by many governments in Asia and the Middle East. Europe, India, the US and others should take note,? said Tyler.